People in Ukraine’s region Crimea are voting on whether or not to re-join Russia in a referendum condemned as “illegal” by Kiev and the West but backed by Moscow. Russian troops have taken de facto control of the majority ethnic-Russian region, and voters are expected to support leaving Ukraine. Crimean Tatars are boycotting the vote, pledging their allegiance to Kiev. Russia earlier vetoed a draft UN resolution criticizing the vote – the only Security Council member to do so. The US-drafted document was supported by 13 Council members. China, regarded as a Russian ally on the issue, abstained from the vote. The US and EU have warned they would slap further tough sanctions against Russian officials if the referendum goes ahead. Russia intervened in the Crimean peninsula by seizing control of government buildings and blocking Ukraine’s troops at their bases after the fall of Ukraine’s pro-Moscow President Viktor Yanukovych on February 22. However, the Kremlin officially denies deploying extra troops there, describing them as Crimea’s “self-defense forces”. Polling stations across Crimea opened at 08:00 local time and will close 12 hours later. 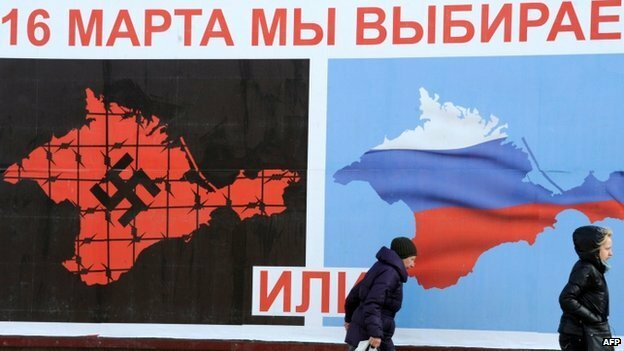 Voters are being asked whether they would like Crimea to rejoin Russia. A second question asks whether Ukraine should return to its status under the 1992 constitution, which would give the region much greater autonomy. Some 1.5 million voters are eligible to cast their ballots, and the first results are expected to be released shortly after the referendum. Ethnic Russians form a clear majority in the region (58.5%), and many of them are expected to vote for joining Russia.